As an artist, I consider art on a sort of spectrum in my mind by the manner in which it is rendered. I picture two opposing ends: one a chemist, who has a pristine lab and measures everything in the most precise manner, conducting experiments in a white coat with the thinnest of pipette, a Bunsen burner, and a notepad to meticulously record results. On the other end is the nudist, someone completely of the body who paints without a trace of inhibition, who never decides what to put on the canvas in advance but just instinctually slathers it on with a huge brush or spatula, perhaps even while sipping a glass of wine with the other hand, all while naked. In my mind I call the two types of artists “The Nudist and The Chemist.” With every painting, I fall somewhere in between—with “The Nudist” being my ultimate goal as an artist, like Howard Hodgkin or perhaps the elder Matisse, working in bed into his eighties with yards of fabric, sunglasses and a big pair of scissors. LEFT: Ethan Murrow, “Lava Collection – Well I definitely heard something” graphite on paper 54”x54” 2005. 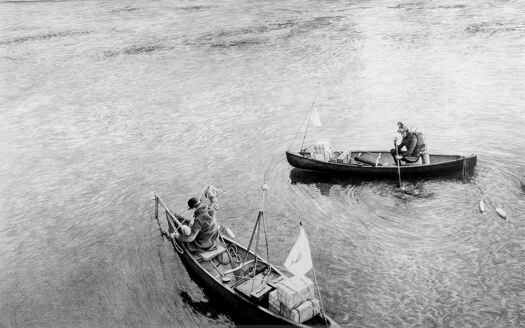 When I first saw the works of Ethan Murrow, I thought they were photographs. I loved the subject matter, the adventures of the people, often the portraits of the artist himself, in the midst of an unknown experiment. Upon second glance, however, when I realized that these are in fact extraordinarily large graphite drawings done with such precision, such sensuality, with a subject matter that deals directly with fear, ambition, and humility, I decided that, nay, he is both a nudist and a chemist and that one can very much be both. Murrow and his wife Vita Weinstein develop plots and film their stories, and then Murrow searches for frames worth portraying by hand. His upcoming show “Dust Mining” debuts March 15th and is his most ambitious to date. Kimberly Brooks: One of the elements that I find so intriguing about your work is the difference between content and medium. Your medium is highly controlled and photorealistic. Yet the subject is highly dynamic, people are doing strange things with ropes in holes, water and air. How does Marshall MacLuhan’s aphorism “The Medium is the Message” apply to your work? Ethan Murrow: I think media effects and often controls the message more than most would like to admit, but I don’t think you can say that it always does. That said, media IS often the overarching structure and also the motivation so it’s influence probably outweighs content and concept a lot of the time. For instance, I began these drawing projects in part because of my pure satisfaction with paper, graphite, the atmospheric effect I can create with it, the meditative plodding process, the obsession required and the raw endless simplicity of this approach. But, those things are also very important to me because they relate to my content. Ideas of obsession, perseverance and pig headed-ness are key elements in both media and concept. I like to think the process/media and the content are integrally linked but I do not think one can exist purely without the other and maintain the same effect. In my work content also brought about the media. I aimed to create work that referenced historical documents, black and white photography, monumental glorification and so on. Large scale graphite drawings fit that bill. So the media is at the mercy of the concept too. KB: What was the inspiration behind the way you approached this series, creating a back story in the first place? EM: In The spring of 2004 I had a chance to do a three-month residency at the Bemis Center for Contemporary Art in Omaha, Nebraska. When I arrived there I was in the midst of projects that dealt with landscape painting and, truth be told, I was somewhat bored with the direction of my work. I spent a lot of time talking with and watching some performance Artists who were also in residence at the Bemis at the same time, particularly the group Bushwick Farms whose work revolves around an extended fictitious genealogy. The simple truth was that they were having a blast, using stories from their own lives to help construct scenarios, events and narratives that engrossed both them and their viewers and participants. 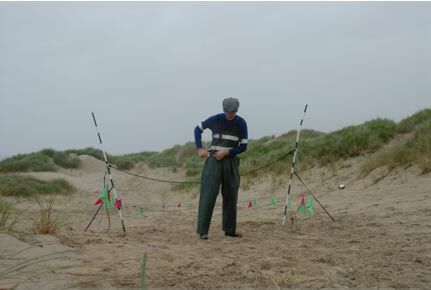 LEFT: Ethan Murrow at Pinto Brothers shoot in Manzanita Oregon 2005. KB: What led you to the subject of experimentation? I have always been obsessed by flight and that became my first subject. I began jumping off of cars fences, ladders and chairs, flying through the air in Nebraska wheat fields in front of cameras, embarrassing myself in front of some local farmers as I documented the body in motion. I then brought this imagery back to my traditional processes and used it to create drawings and paintings. The new work was exhilarating because it was chaotic and unknown. At the beginning, I wanted to create pieces that documented my prowess at flying through the air. It took me a good year of fits and starts and mistakes before I realized that the work was at its best when it captured my weaknesses, mistakes and innocent moments, instead of fictitiously glorifying what I could not achieve. I began to create narratives that dealt more with failure and the overpowering and blinding need to succeed rather than success itself. Many could have told me this from day one, but it took me a long time to realize that I am at my best as a performer and storyteller when I am making fun of my own ego. At the core, my characters are self-portraits, craving glory, yet eternally doomed to make mistakes. 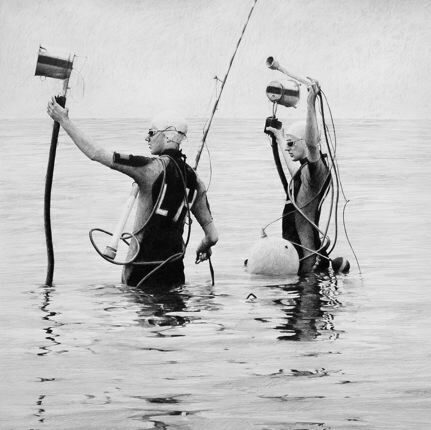 Ethan Murrow, “Off of Gaspé, ready to dive for the elusive whale”, graphite on paper 60” x 96”, 2007. KB: I am a big fan of mistakes. It’s the most exciting and critical part of making art. What is the story within this particular film and how does it illuminate these themes for you? EM: The Freshwater Narwhal Hoax documents the exploits and downfall of the fictitious marine biologists Banvard and Barnum Orson. Banished from the scientific community due to fraudulent methods and suspect motivations, they are determined to rebuild their reputations and achieve the fame they have always desired. The brothers delve into highly suspect whale research and begin to weave a complicated and fraudulent tale for the press. They focus their attention on Narwhal whales and assert to anyone who will listen that they have located a pod on the St. Lawrence River. Hefting gear of unknown provenance the Orson brothers attempt to prove their bald assertions. Their story is one of obstinence and drive in partnership with chicanery. Like many of my characters their insistence on success at all costs becomes their ultimate downfall. The things I keep returning to are failure and obsession. It seems to me that there is a fragile line between reckless obsession and brilliant success. My work resides in this area, applauding ridiculous pursuits and cringing at ill-fated experimentation. To examine these issues I have created fictional narratives rooted in the historical fact that humans will attempt anything. I attempt to give credibility to the ridiculous pursuits of my characters by creating a pseudo documentary world full of black and white photo-realism and fake documentary films about their exploits. I want the work to be believable, insane and humorous all at once. KB: How did this particular story arise? EM: Working with my wife, Vita Weinstein Murrow, a frequent collaborator, a story began to arise from our discussions in early 2006 about two people who had been driven to the edge of their profession and so turned to desperate measures. The characters we had dealt with up to this point were obsessed by fame and glory but rarely had this caused them to swindle anyone. We wanted to dig deeper into failure and investigate what happened to people who had nowhere to turn. The Orson’s aren’t horrible people, they just use their drive and grit in inappropriate ways. 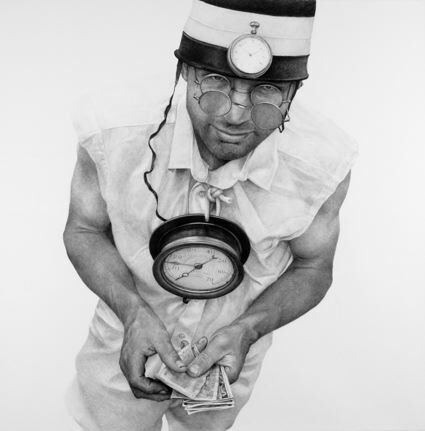 Ethan Murrow, “Cloud Collecting with the Pinto Brothers: at the moment of launch, the quick release jammed and Huffaker lost his cool.” graphite on paper 72”x144” 2006. KB: What is your process and how do you collaborate with Vita to create your work? EM: Half of my time is spent on project development, reading, thinking, researching and planning. Much of this process includes discussions between Vita and me about different story lines, scenarios and logistics, all leading up to performances. The performances are planned yet disorganized. When we began they were two person affairs with Vita shooting video and stills of myself in a variety of costumes. We usually shoot in remote and difficult settings. The entire Cloud Collecting With The Pinto Brothers for example was shot on the Oregon coast over five weekends in 2004 and 2005. Four of those five weekends it was pouring and windy, the fifth it hailed. For that one Vita was in a tent to protect the technology while I tromped around in the sand with various props getting hammered by the hail. I have always felt like these moments of ridiculousness connect me directly with the characters, who all are depicted in equally problematic scenarios. Once the performance imagery has been collected I begin to cull through it on the computer and think about which images connect best to one another to help tell a full story. I then use the collected imagery to create large-scale graphite drawings and short video pieces. RIGHT: Vita Weinstein Murrow directs two actors for Dust Mining shoot in Dorset, Vermont 2007. Now some of this process is changing. Working with Vita and Harvest Films we have crafted a new storyline about a group of miners harvesting dust for profit. We are working with a wide array of actors and media professionals to craft a short film with Harvest for my March show at Obsolete in Venice. This piece will be shot over the next few weeks. It is a big jump, forcing us to more carefully consider every step in story development and opening doors to tools and collaborators we have never had access to before. KB: Indeed, has there been an artist who has inspired you in both your interest in film and drawings? William Kentridge, who creates stop frame animation films about the history, politics and culture he grew up amongst in segregated South Africa, has probably had the biggest effect on my career. His haunting depictions of characters struggling between dream and reality and cause and effect are all rooted in his own experience and figure (meaning he loosely depicts himself as the protagonist in his films). I admire the way he examines his own role in history through his work and formally I can never get enough of his crude yet completely full and confident drawings. Kentridge collaborates with puppeteers, actors, musicians etc etc. and he has served as a model to me in that realm as I have worked to create healthy collaborations with my wife, Vita, and others in different projects. William Kentridge, Drawings from Mine charcoal on paper 120x150cm each, 1991.